Being St. Patty's Day I thought a cabbage recipe was in order-just not from Ireland. I try to do this recipe justice and hope that my Hungarian grandmother looks down and smiles and nods her head. The quantity of ingredients for this recipe is the only way I know how to make it. It is a good thing because you can E.A.T. this for days. Salt, pepper, Hungarian paprika (Hungarian from Szeged) do not make my grandmother roll over. Fry the bacon and reserve the drippings. Stir the sugar in the bacon drippings on low heat. Add shredded cabbage tossing to coat adding salt to taste. 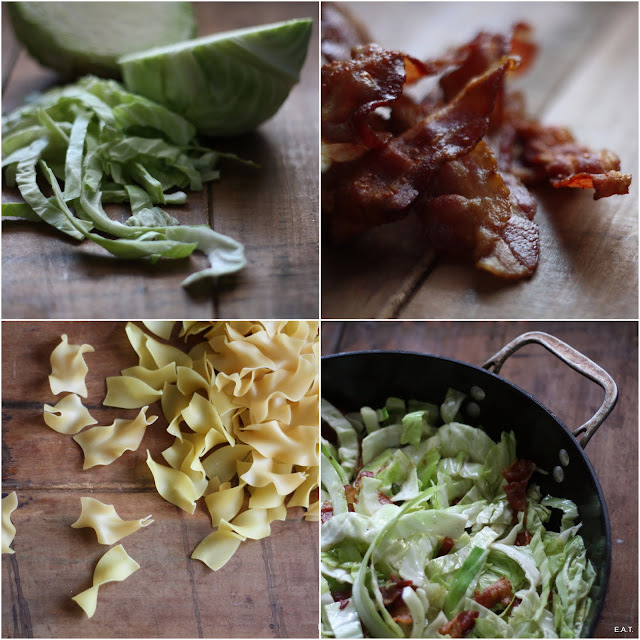 Stir in noodles and crumbled bacon to mix. Grease a 15x12x2 casserole dish pouring in the mixed ingredients above. Bake in a 350 degree oven until hot (20-30 minutes) . Remove from the oven dollop with sour cream and sprinkle with Hungarian Paprika. Return to oven and bake for 10 minutes or until sour cream softens. Serve with fresh crusty bread. That sounds fabulous! My in-laws will be here in a few weeks (from England) and I'll have to try this while they're here. Great can't wait to hear! You can always call it Hungarian "Bangers and Mash"! Now that I've retired...I'm doing a lot more cooking. This looks like something I can tackle with good effect! I don't want to make your grandmother somersault through the ether, eh? Hungarian paprika, here I come! Awesome and I am sure you will enjoy this! Let me know how you like it!